How Are Corps Members Transported? Two separate types of transportation are involved in participating in a Drum Corps International corps. First, transportation to off-season rehearsal camps; second, transportation while the corps is on the road and touring. 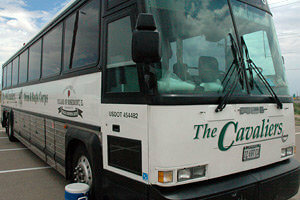 For rehearsal camps, students will generally be responsible for arranging and paying for their own transportation. Some corps may provide transportation from airports/train stations to the rehearsal camp site. 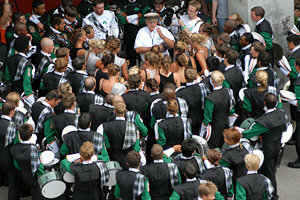 Many corps hold rehearsal camps at locations around the country, thus reducing the student's overall travel expense. When planning your student's drum corps budget, be sure to account for rehearsal camp transportation, as this cost is above and beyond the corps' tuition and fees. Check with your student's corps for specific information about transportation requirements and arrangements. While on tour, the corps is responsible for transportation and the cost of that transportation, which is included in the student's tuition. < Where Do Corps Stay While Touring? When a corps stays overnight at a rehearsal camp or while traveling, it is usually in a school facility (gymnasium or other suitable space). Some corps use hotels, dormitories, churches, armories or other facilities capable of hosting a group of that size. While on tour, Drum Corps International generally arranges for corps housing. In some cases, a corps may arrange its own housing. This might happen if the corps or someone on the corps' staff has a relationship with a specific school or facility. DCI has a corps housing coordinator who evaluates potential housing sites based on DCI's standards, which includes access to rehearsal fields, sleeping and shower facilities, as well as power/water access so the corps can provide food services. When staying at schools or other facilities that do not have beds – which are most housing sites – students sleep in their sleeping bags on gym floors or other available space. Most corps recommend students carry an inflatable mattress or pad. The specific procedures and regimens that a corps follows with respect to housing vary between corps. Check with your student's corps regarding specifics of how the corps is housed and what rules/procedures they follow when on tour. Housing corps during the tour is one of the most challenging aspects of DCI's operations. It is becoming increasingly difficult to get access to facilities, with year-round school, liability/safety, and cost all being critical factors. If you believe you can help DCI find suitable housing and/or rehearsal sites for corps during the tour, please contact us today. How are Students Fed at Rehearsal Camps and on Tour? While on tour or at audition/rehearsal camps, most corps take responsibility for feeding students. To fulfill that responsibility, most corps operate mobile kitchen facilities. A World Class corps expects to feed 150 members, along with approximately 25 instructional and 25 support staffers four times a day while on tour. In a typical summer, Drum Corps International units will feed their combined 5,000 performers and staff a whopping 1.2 million meals! If a corps does not have a mobile kitchen, they likely feed students through a combination of pre-packaged foods, delivery food services and stops at restaurants or other dining facilities. The extent to which the corps provides food and food services will help determine how much money your student will need to have while on tour or at rehearsals. What Insurance Does My Son or Daughter Need? Specific insurance requirements will vary from corps to corps. Some corps will require that the students have a medical insurance policy. Others, especially those affiliated with the Boys Scouts, may offer some medical insurance through that affiliation. The best course of action is to check with the corps, and, more than likely, if your student has medical insurance, leave it in effect. What if Someone is Injured or Gets Sick at a Rehearsal Camp or on Tour? In the case of illness or injury while at camp or on tour, the corps will likely attempt to treat it by appropriate means, unless otherwise designated. Many corps have nurses or other medical personnel who travel with the corps. This lets the corps provide professional treatment of most minor illness or injuries without engaging emergency room facilities. When your student joins a corps, the group will likely provide emergency procedures and emergency contact information. Check with them for the specifics. What Kind of Supervision Do Students Have With the Corps? The first line of supervision in many corps is the students themselves. Most corps place a large responsibility for corps conduct on the student leadership.That said, corps travel with a substantial complement of adults, both staff and volunteers. The touring entourage of a World Class corps usually includes 15 to 25 instructional staff members, 10 to 15 support volunteers, including medical staff, and an additional 10 to 15 management and support personnel. For the bulk of the tour, students are rehearsing. During this time they are under the direct supervision of the instructional staff. Many corps have "contracts" or "agreements" members must sign and agree to as a condition of participation. Issues addressed in these agreements include attendance and tardiness policies, conduct while in uniform, bus etiquette, peer and staff relationship etiquette, smoking and illegal substance use. These contracts are a clear acknowledgement of what is expected and what the consequences are if those expectations are not met. It is also common for a corps to have very specific guidelines relating to adult staff/volunteer and student interaction. For the specifics of tour supervision, check directly with the corps in which your student is interested in joining. How Can I Stay in Contact With My Son or Daughter While on Tour? Most corps facilitate several ways for students and families to stay in contact when the corps is on tour. Contact the specific corps regarding its recommended methods of communication. Examples of communication channels some corps support include: Designated mail stops where you can send mail that the corps picks up as they tour. Cell phones. Most corps allow students to use cell phones on personal time, however check with your corps for specific cell phone use and charging policies. How Much Money Does My Son or Daughter Need to Bring? The amount of money a student needs on tour varies from corps to corps, with the key determinant being meal policy. 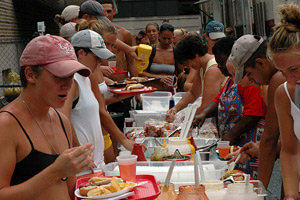 Most corps assume responsibility for providing meals while on tour. On some occasions, a corps may stop at a restaurant, in which case, the student will likely have to pay for the meal. Generally because of extensive rehearsal and travel schedules, students are not likely to have much opportunity to spend money. Items for which a student might need cash include snacks, laundry, souvenirs or money to spend on "free days" – those days during the tour when a corps doesn't practice and spends the day visiting attractions or a city. Most corps recommend not bringing a substantial amount of money on tour because of the potential for loss. Some corps even have "banks" whereby students can deposit their money with the corps and then make withdrawals during the tour as needed. This is a good way to protect against loss. ATM cards are also an attractive alternative to cash, as are student-oriented credit cards that track use and can easily be reloaded by the family.